One theme that seems to flow throughout many yoga classes is the theme of letting go of your ego. We tend to be raised to compete and perform, to be the best and win the shiny trophy. Pushing yourself to achieve new heights can be a good thing—it’s how we finish our first marathon or get promoted to a new position in the workplace. However, that ego can also be a big downfall, especially when it gets in the way of what you really need, physically and emotionally. We’ve been having a nice discussion about listening to your body or heart in the comments of my yoga block giveaway post, which has inspired me to write this post. People who have those “Type A” personalities, like many if not most runners and athletes, have a tendency to keep pushing through discomfort because they think that stopping shows weakness. Often they wind up burnt out if they’re lucky, or injured if they’re not. How do you let go of your ego? Remind yourself of what could happen if you keep pushing. Have that little niggle in your knee or hip in the middle of marathon training, but you don’t want to take any time off? Remember that often those little twinges are our bodies telling us that we need to back off and ignoring them often results in injury, sometimes a big one. Is taking a day off worse than not getting to the start of the race because you’ve badly hurt yourself? 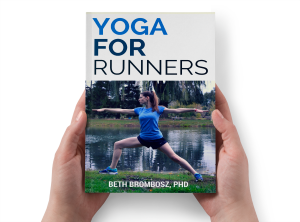 What would happen if you skipped that _____ (run, yoga pose, workout, etc.)? In most cases, taking the “easier” route won’t hurt you in the long run, especially if you’ve been pushing hard otherwise. Fitness and other achievements aren’t built on a single day, they’re the result of weeks and months of hard work. Hitting that pause button when you really need it can only help you in the long run. Stay focused on the present moment. Don’t dwell on the past or the future. Instead, concentrate on what you can do in this very moment to meet your goals. If your mind and body are sending you strong signals that you need a break, listening to what you need now will often give you the best results. If you practice listening to your body, you’ll know when you can keep pushing or when you need to back off a little bit. 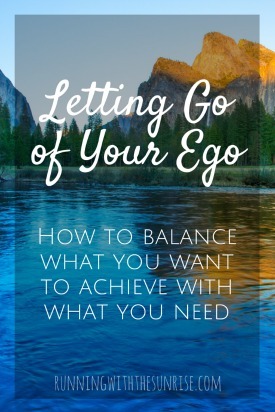 What are your tips for letting go of your ego? I don’t know if I have any tips about letting go of the ego–I’m not really great at that but I have to say that yoga really keeps me humble. There are just some poses I can’t do, because of my limited flexibility in certain areas. Beautiful! I’m the same way! Every time I stretch out my hips I go on another run and they tighten back up! I used to push myself when I felt that niggle and wouldn’t quit. Unfortunately I learned the hard way with injuries. Now I really listen to my body. If I need rest, I rest and I haven’t suffered fitness wise one bit. Me too. I suppose that’s all part of becoming a more seasoned runner. Maybe learning the hard way is something we all have to do? If you’re not used to listening to your body it might be hard to interpret the signals it’s sending you. Love this post! I’m guilty of pushing through a workout when I don’t feel like, and end up feeling worse. Rest days are necessary, and I’m learning to enjoy them 🙂 thanks for this! Thank you so much, Jess! Totally agree about rest days! Staying in the present is the KEY for me. I swear, I never knew to do this before yoga. It’s done wonders for me! Me too! 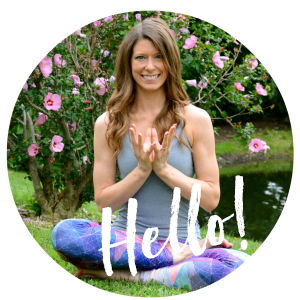 I think it’s probably the most important thing that I’ve learned from yoga, combined with my pranayama to help me stay present! Lately I have the opposite problem, too good at stopping and relaxing. I’m there with ya! Sometimes when you’ve been working hard for a few training cycles it’s good to take a break, though. I love this, because I definitely think that yoga illustrates how your ego can get in the way of your practice and hamper your progress (on the mat or in life). But it also helps you learn how to react to “failure” by laughing and getting back into it. You’re 100% right! I’ve definitely had students who have tweaked a muscle when they’ve gone up into a pose like Birds of Paradise that they practice all the time but it’s just not in their body that day. That’s why it’s so dangerous to just assume your body is in the same place today that it was yesterday (ego!!) and why being present is so important! And love learning from “failure” too! Many of the instructors at my studio say that falling out of a pose means that you’ve found your edge in that pose for that moment, and that’s a good thing! I find my ego gets more in the way during everything other than working out! I feel pretty in-tune when running, doing yoga or lifting weights. It’s my self-confidence in work and life that I find I need to tell my ego to shut it and realize I’m creating stories and situations that are not true. I have to tell that little voice to be quiet all the time. I’m so bad at second guessing myself at work, but am trying very hard to work on being more confident! Great post! Its not too uncommon for me to let my ego get the best of me. I let myself get sidetracked by what I “should” be able to do. I just try to remind myself that it is okay to give myself a break! Thanks, Alyssa! I have to remind myself of that all the time, too!